Hong Kong detective Bennie Black (Jackie Chan) has been tracking notorious crime boss Victor Wong for over a decade. 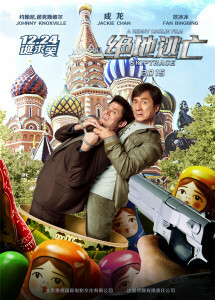 When Bennie’s young niece Bai (Fan Bingbing) gets into trouble with Wong’s crime syndicate, Bennie must track down the only man who can help him: fast-talking American gambler Connor Watts (Johnny Knoxville). Bennie races against the clock to bring Connor back to Hong Kong and the unlikely pair embark on an entertaining and perilous adventure from the snowy mountains of Mongolia to the windswept dunes of the Gobi desert.